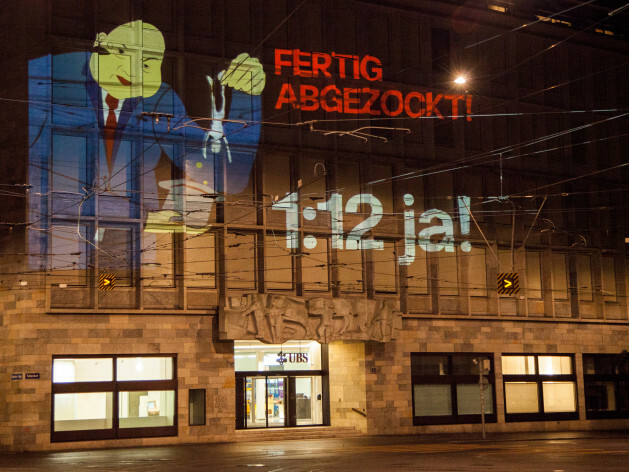 Enough ripping off, the group Juso recently projected onto the UBS headquarters in Zurich. Credit: Ray Smith/IPS. BERN, Oct 29 2013 (IPS) - Swiss voters will decide Nov. 24 on introducing a salary cap that would limit the wage spread in companies to 1:12. The economic lobby is nervous – success for the proposal in the referendum is not as unrealistic as once expected. It wasn’t just the smallholders in the Swiss multinational pharmaceutical company Novartis who were disgusted by a 79-million-dollar farewell package to resigning CEO Daniel Vasella earlier this year. Public outrage was huge. Two weeks later, Swiss citizens sent a clear message to executives that their increasingly excessive salaries and bonuses would not be tolerated: 68 percent of voters supported the “fat cat initiative” which promised to curb salary excesses and to ban big payouts. That referendum was more about strengthening shareholder democracy. Once the initiative is fully implemented, shareholders of Swiss companies will have a veto right on payments to executives. Within a one-share-one-vote frame however, concerned shareholders usually get outvoted by large investors. “No manager should earn more in a month than his employees get in one year." “The fat cat initiative includes some good aspects. However, it neither helps much in limiting big salaries, nor in providing a solution to unequal income distribution,” argues David Roth, president of the Swiss Young Socialists Party (Juso). Juso therefore launched the 1:12-initiative which demands that executives’ salaries be capped at 12 times that of the lowest-paid worker in the same company. “No manager should earn more in a month than his employees get in one year,” Juso demands. Switzerland’s powerful neoliberal lobby had worked hard to prevent the success of the fat cat initiative. After its expensive campaign failed and with the 1:12-initiative already on the horizon, it became increasingly nervous. Further, a referendum on the introduction of a national minimum wage is scheduled in 2014. Once the poorhouse of Europe, Switzerland has transformed into one of the richest countries on earth. Today, it has one of the highest GDP per capita in the world and unemployment at just three percent. In terms of income inequality, Switzerland ranks around Europe’s average. According to the freshest numbers, 3.5 percent of the employed in Switzerland are considered working poor, while 11,586 top earners make more than half a million Swiss francs a year. In Switzerland, trade unions are comparatively weak and the number of collective bargaining agreements is low. A national minimum wage doesn’t exist, the relationship between employees and employers clings to the concept of social partnership, and strikes are rare. It is mainly the upper income segment that has been profiting from the increased individualisation of wage policies. The campaigns for and against the 1:12-initiative have just reached the hot phase. In one corner, there’s Juso, the trade unions and the Social Democratic Party. The opposing side is led by the umbrella organisation of Swiss small and medium-sized enterprises (SGV), with the other economy-related organisations as well as the liberal and right-wing parties on their coat-tails. If the 1:12-proposal is voted in, only 1,000 to 1,300 mostly big companies with about half a million employees would be affected directly. About 4,400 top earners would face a salary cut. The opponents’ campaign, which is unable to explain why somebody should earn 30, 50 or 100 times as much as an employee, focuses on warning the public how everybody would be negatively affected if the 1:12-initiative succeeds. Hans-Ulrich Bigler, director of the SGV, recently said that losses to the old-age insurance system and to taxes could amount to nearly 4.4 billion dollars per year. He argued that tax increases would become inevitable. A closer look at the concerned study shows that this number is based on a rather unrealistic worst-case scenario. Juso believes the initiative would reduce income inequalities, and elevation of the lowest wages would minimise possible fiscal losses. Nobody is able to estimate economic and fiscal consequences at this point, as everything will depend on how affected companies would react to a new 1:12-rule. Would they elevate the lowest wages? Would they cut the top wages and use the money for investments? Or would they leave the country, as for example Ivan Glasenberg, CEO of the commodities giant GlencoreXstrata, has threatened? The Swiss government fears first and foremost for the country’s competitiveness. “There is a real danger that Switzerland-based companies could leave the country, while foreign companies searching for a new location could be deterred by the limitations on high wages and not settle here,” Swiss Economics Minister Johann Schneider-Ammann said at a press conference. When in 2009 Juso, led by David Roth, began to collect signatures for the 1:12 initiative, nobody expected that the proposal could have real chances for success. “The approval of the fat cat initiative in spring represented a break with the past. After years of deregulation and liberalisation people again started to demand rules for the economy,” Roth says. Roth is aware of the fact that only one in ten popular initiatives turn out successfully. Nevertheless, he is confident that on Nov. 24, David will win against Goliath.